Well, it is finally, at long last, U.S. Election Day 2016, a day that billions of people hope will be over as soon as humanly possible. But since it’ll be roughly 24 hours long no matter what humans do, we might as well make fun of it to help pass the time. This is of course the most bitter and divisive presidential election in American history, except for several of the others. Although the first two were basically unanimous because Mr. War Hero George Washington was running (I like war heroes who didn’t surrender, OK? ), things got ugly just as soon as he retired. By then (1796) we had political parties, the Federalists who supported John Adams and the Democratic-Republicans who supported Thomas Jefferson. The other side, meanwhile, accused Adams of being sympathetic to England, being a monarchist (partly because he thought presidents should be called “His Excellency”), and even for being overweight, ingeniously combining the last two by referring to Adams as “His Rotundity.” They fat-shamed John Adams! The 1796 election remained the ugliest one ever until—well, until the very next one. The 1800 election, basically a rematch of 1796, featured the same kind of slander. This time Adams was “a repulsive pedant” with a “hideous hermaphroditical character,” while Jefferson was said to be the “son of a half-breed Indian squaw sired by a Virginia mulatto father,” and so on. Both parties also tried to rig the election by changing the way states picked electors. Jefferson won, of course, though only after a tied electoral vote was resolved in the House of Representatives. Were there any hard feelings left over from this election? Well, the Vice-President did kill a dude during his term (the famous Burr-Hamilton duel), so it seems fair to say the answer is yes. But arguably even that badness record stood only until 1824, when Andrew Jackson won the popular vote and the electoral vote but still lost. That is, he had more electoral votes than anyone else but still not a majority; under the 12th Amendment (ratified in 1804 after the horrible 1800 experience), that vote too went to the House, which elected John Quincy Adams by a single vote. And ooh, were Jackson and his friends pissed about that. In the popular press, the rhetorical attacks reached a level of cruelty and misrepresentation not seen since the election of 1800. Jackson was accused of multiple murders, of extreme personal violence [he did kill a guy in a duel], and of having lived in sin with his wife, Rachel, who herself was attacked as a bigamist. Adams, on the other hand, was attacked for his legalistic attitudes, for his foreign-born wife, and for reportedly having procured young American virgins for the Russian czar as the primary achievement of his diplomatic career. Adams’s critics referred to him as “His Excellency” while Jackson came under attack as an ill-mannered, barely civilized, backwoods killer of Indians. Wow! To my knowledge, Hillary’s only been accused of one actual murder, and while I believe Trump would be willing to procure young American virgins for Vladimir Putin, I don’t think anybody’s accused him of actually doing that. So I will. Apparently, James Buchanan had a congenital disorder that caused his head to tilt slightly to the left, and his opponents in 1856 “claimed that he had tried to hang himself but failed,” which is pretty horrible. One of Lincoln’s opponents called him “the original gorilla,” and although I’m not sure exactly what that means it wasn’t a compliment. William Jennings Bryan was “diagnosed” as a megalomaniac and a “classic degenerate.” Both Nixon and Kennedy pulled numerous dirty tricks in 1960. Nixon staffers orchestrated fake phone calls and letters that helped destroy Muskie’s campaign in 1972, and of course routinely engaged in burglaries and eavesdropping of the kind they later got caught doing at the Watergate Hotel. And then there was the 2000 debacle. None of this is meant to minimize the abject awfulness of this campaign season, which has been long, stressful, and embarrassing and which, despite the above, might actually have reached a new low in terms of campaign rhetoric. I guess the point is to suggest we should at least think in slightly less apocalyptic terms about what such a campaign means for the country, because it’s not an entirely new phenomenon. Do I think electing Donald Trump would be a semi-disaster? I do. Sooner or later, a guy who talks like he does, but who is both much more evil and much more competent, is going to be given power based largely on fearmongering and divisiveness, and then democracy really will be under serious threat. I don’t think Trump is that guy, I just think he’s a big-league step in the wrong direction. But history suggests we would survive a Trump (or Clinton) presidency, even if it had been brought about by a gang of cut-throats who walk in rags and sleep amid filth and vermin. Sorry, I just wanted to use that one, I don’t think it’s accurate this year either. P.S. 270toWin.com has info and electoral vote maps for all 58 presidential elections to date, if you’re interested. The maps are interactive, so you can play around with “what if” scenarios. 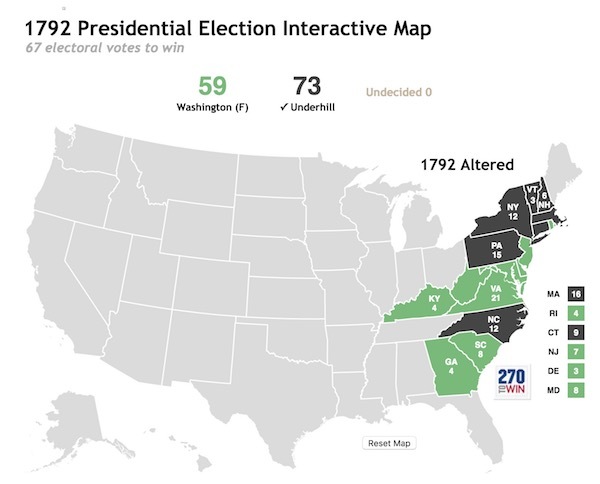 Like this one, which shows me beating George Washington in 1792 by 14 electoral votes (I’d have won Rhode Island, too, except it was too small for me to click on). Again, historically Washington won unanimously, but in my scenario he was being investigated for using a private postal service for certain messages, which was like a huge deal at the time, really. Seriously. That’s actually true. Can a Convicted Felon Serve in Congress?